U. S. industrial designer who studied at Yale University of Fine Art in New Haven, CT, and at the Grand Central School of Art in New York. In 1931 he was hired as a market analyst at General Electric’s headquarters in Bridgeport, CT, and in 1933, joined Ray Patten’s new Appearance Design group. 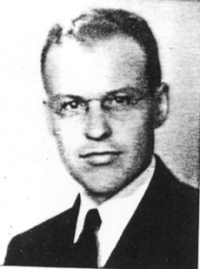 In 1940, he became assistant director under Patten, and assisted in the design of the passenger (PA) and freight (FA) versions of the American Locomotive Company (Alco) and GE diesel locomotives. By 1946 Florian left GE to open his own design office in Bridgeport.He became a member of the Society of Industrial Designers (SID) and participated in an SID product design seminar at Lehigh University in 1949, lecturing on design analysis. He had taught design at the Junior College of Connecticut, which became the University of Bridgeport after the war, and in 1949, he established a four-year industrial design program there. From 1950 to 1954 he lectured to engineering and business students at MIT.